Many pastors in the provincial towns and rural villages of Malawi struggle to find practical relevance in the letter to the Romans. While the majority of church leaders have received little or no formal Bible and ministry training, they often face formidable challenges from African traditional practices, folk Islam, poverty and poor education - creating barriers to authentic Christian discipleship. 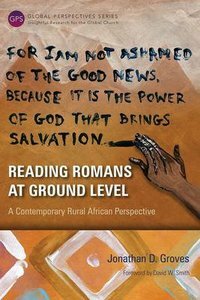 Reading Romans at Ground Level uses field research to characterize pastoral ministry in provincial-rural Malawi. By examining current preaching practice, it shows that Malawian pastors mostly use individual verses from Paul's letter within inductive needs-driven sermons or gospel calls for conversion. In this book, a three-horizon contextual approach is used to investigate how the letter might be applied biblically to address contemporary African socio-cultural and pastoral issues. It demonstrates surprisingly rich parallels between the way Romans might have been heard by its original recipients in the slums of Ancient Rome, and its potential meaning for Christians living in poverty in rural Africa today. About "Reading Romans At Ground Level (Global Perspectives Series)"